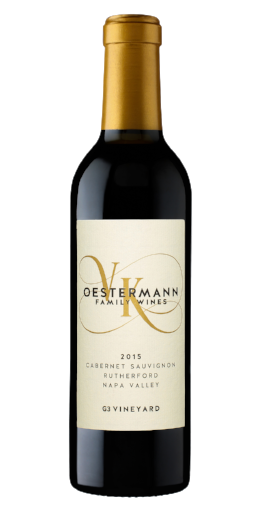 Oestermann Family Wines is a small lots, limited availability producer of high quality, opulent, single vineyard Cabernet Sauvignon & Cabernet Franc from the top vineyards in Napa Valley. The family also produces a Napa Valley Cabernet Sauvignon Rosé and a rich single vineyard Sonoma Coast Chardonnay. The team behind Oestermann Family Wines is a Napa Valley/San Francisco based father daughter duo, who developed a passion for wine making after moving to California from Denmark. Klaus Oestermann has been part of the high tech industry for the past three decades and decided in 2009 to finally pursue his passion for wine making once his daughter Victoria began to develop the same interest. Over nine vintages the production has grown to a modest 450 case annual production of six different wines. Our 2016 G3 Vineyard Cabernet Sauvignon is built around rich flavors of Black cherries, caramel and dark plums the 2016 vintage from G3 Vineyard also reveals complex aromas of Wild berries, red currants and spice. Our 2016 Cabernet Franc is built around a rich core of blackberries, butterscotch and dried cherries, the 2016 Cabernet Franc vintage from the Prichard Hill part of the Stagecoach vineyard reveals complex aromas of Cassis, violets and tobacco. Our Cabernet Sauvignon Rosé is sourced from great Napa Valley vineyards; it was a crowd favorite last year, and for this release we have once again created a light, elegant and perfectly balanced rosé that evolves nicely in the glass. Stagecoach vineyard is in the heart of Atlas Peak, dominated by the unique red volcanic soils of the area. This south-facing fruit consistently produces slow ripening high-quality fruit. Our Rutherford, Napa Valley Cabernet Sauvignon is from one of the most sought after vineyards in the valley. Fruit from this vineyard is of unique quality and has rich valley floor flavor. Our 2016 Stagecoach Cabernet Sauvignon is built around rich flavors of toffee, mocha and black cherries the 2016 vintage from Stagecoach also reveals complex aromas of vanilla bean, blackberries and cocoa powder. Our 2018 Rosé is in a tip of the cap to Old World nuance and sophistication, our 2018 Napa Valley Rosé of Cabernet Sauvignon reveals whispers of tart cherries, complimented by subtle hints of apricots and Satsuma oranges. Our Cabernet Sauvignon Rosé is sourced from great Napa Valley vineyards, we created a light, elegant and perfectly balanced rosé that evolves nicely in the glass. Our first release was a crowd favorite, and for our second release we created a magnum bottle! Seductive aromas of dark red cherry, caramel, olive, an undertone of nice oak flavors and you sense the Rutherford dust. This big Cab evolves beautifully in the glass and exhibits intriguing layers of red fruit, spice and savory herb notes as it opens up. This wine is complex, and perfectly balanced. AGING: Drink now, but decanter or age through 2017-2037. FERMENTATION: 4 day cold soak, 12 day primary, 14 day extended maceration. Seductive aromas of dark red cherry, caramel, toasted coconut, an undertone of oak flavors and a sense of the Rutherford dust. This big Cabernet Sauvignon is smooth, evolves beautifully in the glass and exhibits intriguing layers of dark fruit, spice and savory herb notes as it opens up. FERMENTATION: 4 day cold soak, 10 day primary, 13 day extended maceration. Nice aromas, great balance and acidity, a slight hint of oak, raspberry on the mid palette, and a nice infusion of melon at the finish. Serve chilled and this Rosé evolves beautifully in the glass. AGING: Drink now or age through 2019. The Broken Rock vineyard is at 800 ft. elevation at the base of Atlas Peak on the eastern ridge of the valley. This fruit gets the best of both worlds; hillside structure & rich valley floor flavor. Ripe plum, mocha, black cherries, balanced oak and vanilla flavors; which all play nicely together and continue as a decadently luscious, densely textured, velvety mouthful of big Napa Cab. These aromas and flavors continue to delight the palate through the long and rich finish. AGING: Drink now, but decanter or age through 2017-2027. FERMENTATION: 4 day cold soak, 10 day primary, 12 day extended maceration. We handcraft big and beautiful single vineyard cabs from some of the most opulent valley floor and mountain fruit Napa has to offer. We have also added a delicious Sonoma Coast Chardonnay in 2017. Over eight vintages the production has grown to a modest 350 case annual production of five different wines. Our Cabernet Sauvignon grapes are sourced from the best Napa Valley vineyards such as Stagecoach Vineyard (Atlas Peak), and the famous G3 Rutherford Vineyard. Stagecoach Vineyard - Stagecoach Vineyard is rich in story, rock and perennial high scoring wines. One of the largest, most beautiful and highly acclaimed vineyards from which we source, Stagecoach climbs between 900 and 1700 feet up the southern face of Pritchard Hill to Atlas Peak. The site is planted to a wide range of varietals and rootstocks and features several distinct microclimates. In 2014, 2015 and 2016 we sourced our Cabernet Sauvignon from the small, steep Block 7 near the top of the site. This section is lower yielding than most of the vineyard. This south-facing fruit consistently produces slow ripening high-quality fruit. In 2017 onwards we are sourcing our Cabernet Sauvignon from the Pritchard Hill section of the vineyard. G3 Vineyard - Our Rutherford, Napa Valley Cabernet Sauvignon is from one of the most sought after vineyards in the valley. One of the most historic and sought after properties in the world – G3, as we call it, was originally owned and planted by Thomas Rutherford in 1895. Georges de Latour, founder of Beaulieu, purchased the site in 1928 and it became the home to BV’s Rutherford Cabernets made by elite winemaker, Andre Tchelistcheff, throughout the ‘60’s and ‘70’s. The site was then purchased by Beckstoffer Vineyards in 1988. Andy, Dave and team have replanted using modern clones, trellising and spacing to yield optimum quality. Wines from this field consistently score in the high 90s. Fruit from this vineyard is of unique quality and has rich valley floor flavor. Opulent, rich and full-bodied with black currant, cedar, cassis, black-licorice and cherry complimented by earthy flavors associated with Rutherford Dust.